Listen to "The Lost Order: A Novel" on your iOS and Android device. 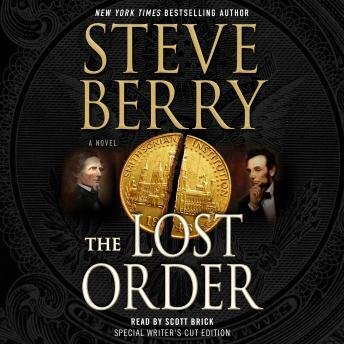 In this audiobook, Steve Berry and Macmillan Audio have teamed up again to bring listeners an expanded, annotated Writer's Cut audiobook edition of The Lost Order. This Writer's Cut edition is read by critically-acclaimed and award-winning narrator Scott Brick and features fascinating behind-the-scenes commentary read by the author, Steve Berry. Now, one hundred and sixty years later, two factions of what remains of the Knights of the Golden Circle want that lost treasure-one to spend it for their own ends, the other to preserve it. Thrust into this battle is former Justice Department agent Cotton Malone, whose connection to the knights is far deeper than he ever imagined. At the center is the Smithsonian Institution-linked to the knights, its treasure, and Malone himself through an ancestor, a Confederate spy named Angus "Cotton" Adams, whose story holds the key to everything. Complicating matters are the political ambitions of a reckless Speaker of the House and the bitter widow of a United States Senator, who together are planning radical changes to the country. And while Malone and Cassiopeia Vitt face the past, ex-president Danny Daniels and Stephanie Nelle confront a new and unexpected challenge, a threat that may cost one of them their life. From the backrooms of the Smithsonian to the deepest woods in rural Arkansas, and finally up into the rugged mountains of northern New Mexico, The Lost Order by Steve Berry is a perilous adventure into our country's dark past, and a potentially even darker future.